My attention was drawn to a new direction that fantasy author Terry Pratchett is taking. His Discworld series has been a huge success among a wide circle of people who find the Tolkien-informed, politically-aware stories clothed in a rambling fantasy universe compellingly funny. The ‘Long Earth’ is a (possibly infinite) series of parallel worlds, similar to Earth. The “close” worlds are almost identical to ‘our’ Earth, others differ in greater and greater details, but all share one similarity: on none are there, or have there ever been, human beings. 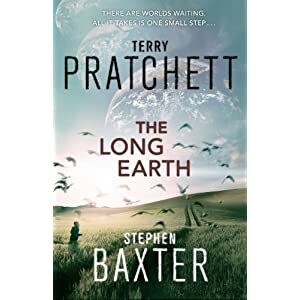 The books will explore the theme of how humanity might develop when freed from resource constraints: one example Pratchett has cited is that wars result from lack of land – what would happen if no shortage of land (or gold or oil or food) existed? According to the Guardian, this new departure is actually based on ideas Pratchett was considering in 1986 before the Discworld series took off. I’ll certainly be interested – I’ve pre-ordered [links: US | UK].